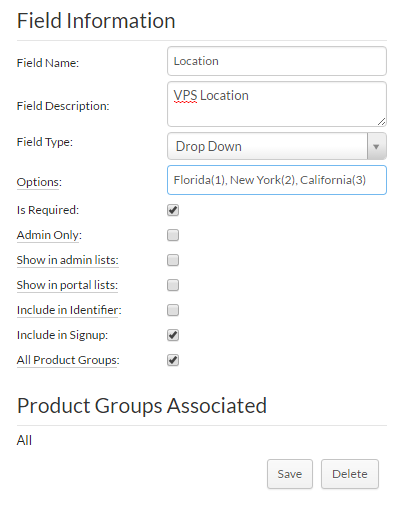 Here, you will add the name of the new custom field you will create to store the Location of the VPS and save the server. The options should be a comma separated list of “Location(SolusVM Node Id)”. Once this has been saved, make sure you associate your new product custom field with the product group. This will now allow your customer to select a different location (or node group) when ordering! What’s the next feature you want to see in Clientexec? Post on our Feature Request System and make your dream feature come true! 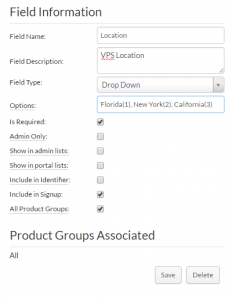 Author Matt GrandyPosted on February 8, 2017 Categories New FeaturesLeave a comment on New Feature: SolusVM Locations! Clientexec 5.8.0 Beta 1 Released! Hadi on Clientexec 5.7.0 Beta 2 Released! If you want to learn more about cookies, or how to control or delete them, please visit aboutcookies.org for detailed guidance.